The Louis Vuitton America’s Cup World Series (ACWS) is a full plate of world class sailing appetizers—8 prep races the world over, pitting the defending champion ORACLE TEAM USA against five challengers, including Great Britain’s Land Rover BAR—that precedes the main course; the America’s Cup finals in Bermuda in June 2017. New York City plays host to the ACWS this weekend, bringing world class sailing racing back to the Hudson River for the first time since 1920. Winning the oldest sporting trophy in the world is, not surprisingly, the number one goal for all six contenders. Happily, it says here, concern for the health of the marine environment and ocean sustainability is moving up the priority list in America’s Cup circles, in large part due to the work of Land Rover BAR and its Exclusive Sustainability Partner, 11th Hour Racing. In fact, sustainability was THE topic of discussion at Thursday’s Land Rover BAR media breakfast and was also on the menu at the ACWS introductory press conference that followed. Over the past year, GreenSportsBlog has written a great deal about how Sir Ben Ainslie, his Land Rover BAR America’s Cup sailing team and 11th Hour Racing, its Exclusive Sustainability Partner, along with other corporate partners, are working hard to achieve what would be two sporting firsts: 1) Win Great Britain’s first America’s Cup, and 2) Do so while reducing carbon emissions. Click here, here and here for our earlier stories on Land Rover BAR and 11th Hour Racing. Of course, GreenSportsBlog would be keenly interested in the groundbreaking sustainability aspects of the Land Rover BAR story—GSB’s beat is, after all, the intersection of Green + Sports. But, at Thursday morning’s Land Rover BAR media breakfast in advance of this weekend’s America’s Cup World Series New York event, every question asked of Sir Ben by journalists from The Guardian USA, Sports Business Journal, TimeOut New York and others, was about sustainability. Maybe, just maybe, pardon the pun, the climate is changing around media coverage of Green-Sports—and for the better. 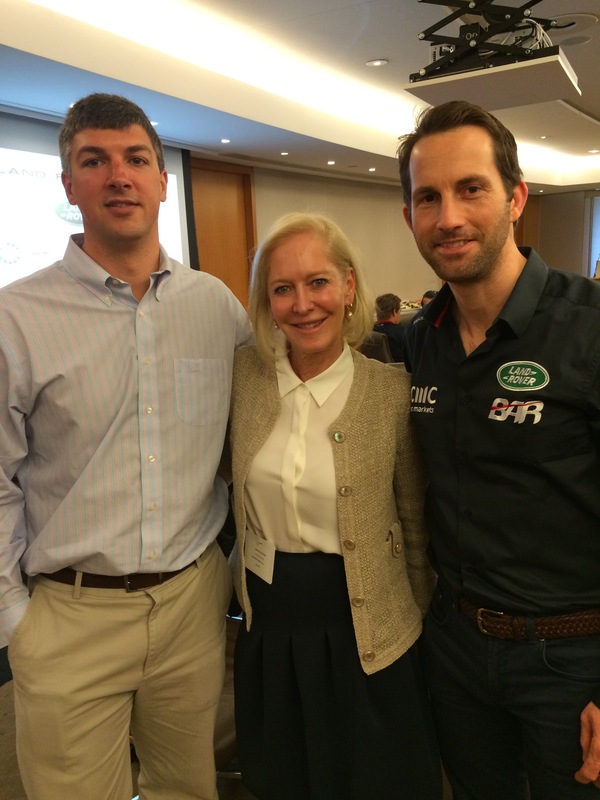 Todd McGuire (l), 11th Hour Racing Program Director; Wendy Schmidt, 11th Hour Racing Co-Founder and Sir Ben Ainslie, Skipper, Land Rover BAR. 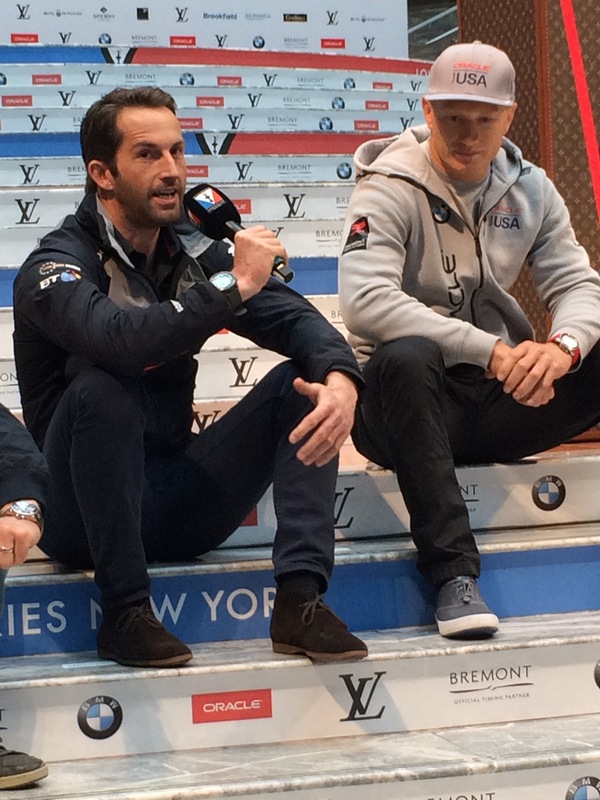 Sustainability and ocean health also was part of the discussion at the America’s Cup World Series New York opening press conference at the Winter Garden Atrium in Lower Manhattan. One of the reporters asked a question about how the skippers deal with “all the crap in the water.” Sir Ben took the mic and told the assembled media about the 10-point Sustainability Charter the six skippers are taking on. Reporters scribbled notes. Video cameras recorded. The media climate around Green-Sports is (slowly) a-changin’. Attractive portion of content. I simply stumbled upon your weblog and in accession capital to say that I acquire in fact enjoyed account your weblog posts. Anyway I’ll be subscribing on your feeds and even I achievement you get admission to consistently fast.